You will be seated at your computer in the comfort of your home or office for this event. Have you wanted to capture the moon “right where you want it” but weren’t sure how? If you know you could resort to photo editing and fake it but you’d rather get the real deal then this class is for you. 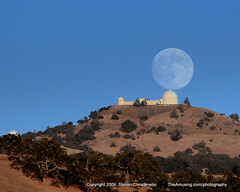 Steven will demonstrate how to determine when and where to go to capture an image like the Moon over Lick Observatory (below), or the moon at the Transamerica Building (left) or the sun shining through a portal in the Pacific Ocean (below). This is a Webinar so you can conveniently attend from your computer at work or home anywhere in the world. In this 90 minute Webinar, you will be introduced to several free (and almost free) tools that you can use to plan a moon (or sun) shot – including a tool written by Steven and made available only to attendees. One indispensable tool covered in detail is the Photographer’s Ephemeris by Stephen Trainor. 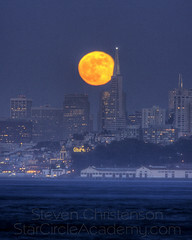 Steven will show how to plan a moon or solar “contact” shot. How to use the moon to illuminate your foreground, how the presence of the moon affects photos of the night sky, how to find information about interesting celestial events, how to find compelling locations for “alignment” images, and what camera settings you need to get it all exposed just right. How many of these questions can you answer? The answers will tremendously help you capture the moon when and where you want it. 1. By definition a new moon is when what occurs? 2. What time of day is it when the Full moon rises? 3. How big (in angular degrees) is the moon? 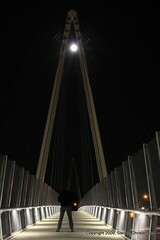 What focal length lens would you need to fill the frame with a shot of the moon? 4. How many days are there in a lunar cycle? 5. By approximately how much does the moonrise time change from one day to the next? 8. A full moon, directly overhead in the sky requires approximately what length of exposure at f/9, ISO 200 to preserve detail? How long would that exposure need to be for a fully eclipsed moon? 9. How long does it take for the moon to move it’s full diameter in the sky? You should have a decently fast internet connection! Dial-up won’t work for audio or the data content. We recommend that you use your computer microphone and speakers to talk and listen so you must at least have speakers. My recommendation is get a headset for this if you do not already have one. Specifically I suggest getting a Plantronics headset with a microphone and a USB connection. Such headsets can be found at Best Buy for from $25 and up. USB headsets with microphone can be used with Skype and many other online games, and calling tools. They come in many styles include behind the head and over the head, single ear, open ear and closed. Most laptops include speakers and microphones but the audio quality of these is generally very poor. Some webcams also include built in microphones but generally the quality of those is poor. Don’t have a microphone? That’s OK, too… you can interact through text chat and you can use your iPad (or Android) smart phone. Refunds? – we don’t offer them. Read here for why. Want to register after registration has closed? Sorry, we don’t do that. Read here for more. There will be yet ONE MORE step you’ll have to take (we wish we could eliminate it, but at the moment we can’t). After registration closes we will send you an email with instructions on how to get the webinar access code and any additional materials hints and tips to make your Webinar a success. IF you are not allowing emails, do not check, or have allowed our informative non-spammy emails to go into your SPAM bin, you may not get the information. So please: add “Info@Meetup.com” and “Steven@StarCircleAcademy.com” to you contact list. By the way, HotMail and AOL are notorious for dropping lots of valid email. Will there be a recording of the webinar in case I want to listen again? Will you repeat this webinar? When? Most likely. But we make no guarantees. Where should I send any questions I have? During the webinar we will let you know where to send your questions. If you have a question before the webinar, please post it in the comments below. What about notes, can I get notes? See the answer to 1. For this event notes are available for free.